Elixir is a 2X Reserve Champion and at the age of 12 still maintains his soft handle with incredibly dense fiber. He is truly an exceptional male. However, the proof of an exceptional herdsire is in his progeny. A herdsire who consistently passes his genetics to offspring is essential to any breeding program. We, as alpaca breeders, must strive for this to improve the next generation of our national herd. However, breeding a herdsire to only ‘elite’ females may not tell you if he has the ability to improve the next generation. Elixir has been bred to females of Peruvian, Chilean and Bolivian heritage. His offspring are consistent improvements over their dam. They have correct conformation with an alert stance and good bone. 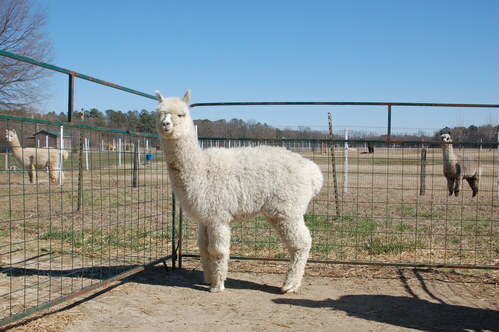 Owners have often commented on the ‘Elixir head’ of their crias. You can just pick them out! Their fiber is dense, soft and crimpy with great coverage. Elixir also allows color to come through with offspring ranging from white to true black. 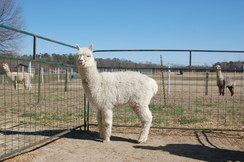 To date, Elixir has sired 60 crias. As of the Fall 2013, 57 were eligible to show. 39% of his offspring earned Blue Ribbons, 19% were Champions and one was a Judges’ Choice. Stats like these are hard to find. His 3 youngest crias are anxiously awaiting the Spring and Fall shows to follow in their siblings footsteps. Elixir’s fiber has maintained its fineness, soft handle and density – a rare find in a 12 year old herdsire. Elixir congratulates his Champion Offspring! Winner of Judges Choice Award at Empire (08) for outstanding female Champion!